Right now is dungenous crab season and it is one of my favorite foods. Luckily, if you live in Oregon, we have these delicious little critters crawling around on our coastal shores. Oregon crabbing has done an excellent job of sustainably harvesting the local crab resources. Another benefit--Dungenous Crab is listed as a "Best Choice" by the Monterey Bay Aquarium Seafood Watch. 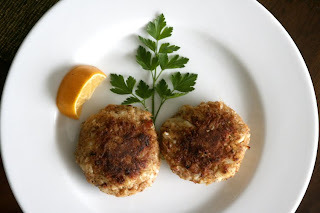 Pretty much the only way I like crab cooked is in crab cakes (or stuffed into fillet mignon). I've been disappointed many many times by this dish in restaruants. Sometimes there is too much fillers. Sometimes there is too much bell pepper (WTF would you put bell pepper with crab?). There seem to be a lot of ways to F* up crab cakes, and everyone seems to do it differently. So, I started reading. About 12 of my cook books have recipes for crab cakes. About 6 of my cookbooks have good recipes for crab cakes. 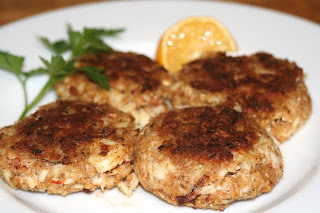 Cynthia Nims has a good, clean recipe for crab cakes in her Crab cook book. 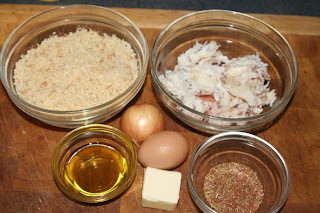 It is amazing how much crap people want to put in their crab cakes. Interestingly, every recipe I had included green onions. These were worthless in my estimation--no real favor benefits, just some green flecks. What I was looking for was something simple that kept the crab texture and flavor clean while adding some depth and complexity. Now, by "depth and complexity", what do I mean? Crab has a bright, strong, wet flavor. It's sort of a transient flavor also--the after-taste is different than the initial bite. To my pallete, strong earthy flavors wouldn't work. Herby flavors might be okay. Acidic flavors only is small amounts. Salty would be good. Black pepper could be neat. Hot pepper could be neat too, but in very small amounts. Sweet could go in too. Bell peppers are not okay. Slippery flavors wouldn't be good. Either would fruity or bitter. Overall, the ideal crab cake should have a clean crab taste that is supported by mild earthy and herby undertones and peppery highlights. I kept it lumpy because crab paste cakes was not what I was going for. I have to be honest, I bought my crab meat at Costco. One pound of fresh dungeonous crab meat (from Pacific Fresh in Clackamas) for $16 is a steal. And since it's 100% dungenous crab, it can't be from too far away. Again, I run into my "local industrial" conundrum. From leftover bread I got at the farmer's market. I forget the name of the bakery, but you can find several local bakers at the Hillsdale Farmer's Market through the winter. Where does the wheat come from? I have no idea (saving that one for another time). From Noris Dairy. They do home delivery. From the Farmer's Market. I'll update with the farm. For this one I tried several things. Spice is very important to crab cakes, I found out. A few recipes call for Old Bay seasoning, which I bought and didn't like for its too strong celery flavor. What turned out to be the best was my own BBQ seafood rub. In a blind taste test, one out of one pregnant wives prefer my BBQ seafood rub to everything else. Total score: 75% (I'm giving myself half points for the crab). Hey, Jason, I like the blog) (Also like the crab cakes--just got back from Coos Bay and had some nice ones there in a shack on the docks). YUMMY! These sounded so good I had to make them. So I did this weekend and they were delicious. Great recipe. Thanks! I am making Raisin Cookies! I hope they taste good! I really liked Christmas dinner! P.S I like the whole website idea! I'm glad you enjoyed them Kris!